Traditional styling and exceptional workmanship combine to make this shoe bag an accessory that will offer years of use and convenience. 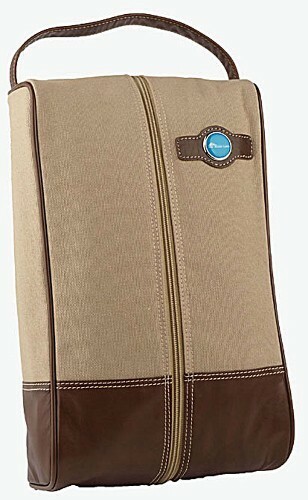 Rugged canvas with top-grain leather trim and piping and full-length zipper. Ample size for shoes and additional personal items. Easy-clean, moisture-resistant nylon interior, zippered divider pocket, air vents and sturdy leather handle all add up in making this truly unique and a favorite for the golf enthusiast. Tan Canvas / Brown Leather only. Frosted etch - add $ .50 per piece running charge.